If you are looking for heavy duty shelving on which to store boxes or loose items in your warehouse or workspace, then our longspan system is the perfect solution. This robust and versatile range of shelving can take up to 1000kg (uniformly distributed load) per shelf and shelves can be adjusted at 50mm intervals on the upright frames. We have large quantities of this hand loaded shelving in stock, in a wide variety of sizes and with standard chipboard shelves or dropover steel panel shelving. Our friendly and helpful team can help you to find the best configuration to suit your space and product sizes, so get in touch now and ask for a delivered price to any UK mainland address. Whether you are in Swindon, Essex, Liverpool or Edinburgh, we can usually deliver in 3-5 working days. Call us now on 0800 612 3210 or send a message on our enquiry form and we will reply to you quickly. 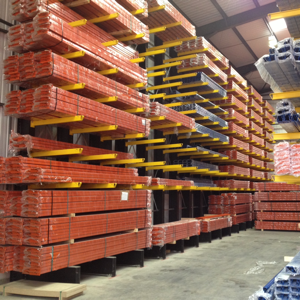 Redirack is one of the most popular manufacturers of warehouse storage systems and we have huge stock of used Redirack pallet racking currently available. 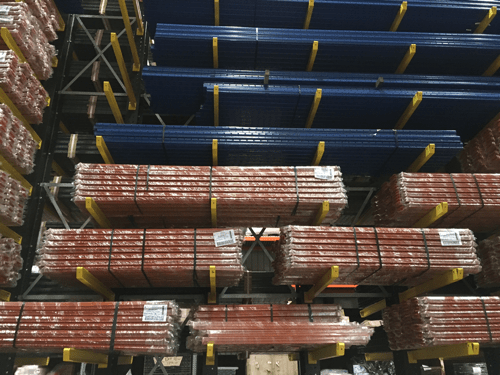 2700mm beams can be paired with 1100mm deep frames to store three euro pallets on a level or with 900mm deep frames to store two uk pallets on a level. 2250mm beams are used with 1100mm deep frames to store two uk pallets on a level. All our used pallet racking frames are supplied with footplates attached and including fixing bolts. All beams are sold with the required number of beam locks as standard. We have many other warehouse racking systems in stock, including Dexion, Link 51, Apex and PSS. Orders of any size can be delivered to any UK mainland address, so whether you are in Edinburgh, Gloucester, Hull or Essex get in touch now for a great delivered price. Call us on 0800 612 3210 or send a message using the enquiry form. 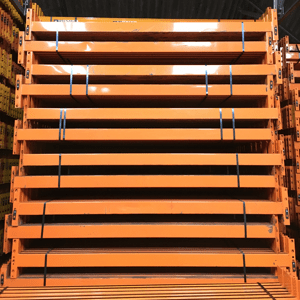 Whether you are buying a single bay for warehouse storage or a full unit of industrial racking, it’s important that your pallet racking is safe and protected from expensive damage. Locking pins should be used on every beam to prevent accidental dislodging. We have huge stocks of all types of beam locks (Dexion, Link 51, Redirack, Apex, PSS, Hilo etc) so please make sure any missing or damaged are replaced immediately. 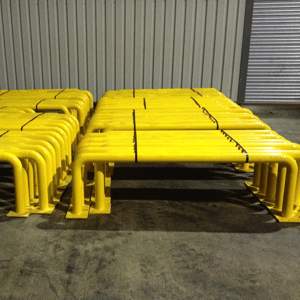 Column guards and rack end barriers are also essential to protect your racking from damage by fork lift trucks. We can supply these quickly (along with fixing bolts included as standard), so please get in touch now if you are missing any racking protection. 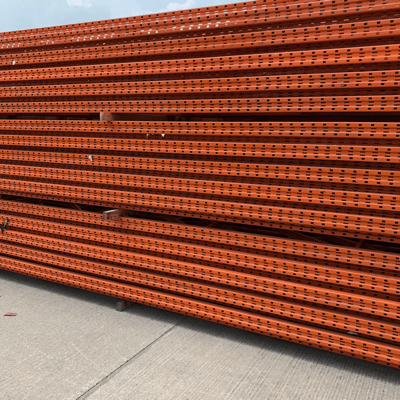 We have deliveries of used pallet racking going to Worcester, Essex, Liverpool, York, Derby and Edinburgh in the next couple of weeks and we should be able to fit in a pallet of column guards if required. We’ve completed some big orders of used pallet racking and warehouse shelving in the past couple of weeks, but stocks remain good and we are dispatching new and used materials as quickly as we can. We have a limited amount of space still available on deliveries going to Liverpool, Essex, Newcastle, Nottingham and Bristol in the next week, so if you are close to these areas get your order in now and we will do our best to give you a great delivered price and a short lead time. We still have huge stocks of Dexion, Apex, Redirack and Link 51 used pallet racking as well as new heavy duty shelving and new pallet racking. So whether you need warehouse racking or hand loaded shelving, call us now on 0800 612 3210, or send an enquiry, and we will reply quickly with a low price. Spring is here and with it comes a new financial year, which means you can finally get that additional warehouse storage you have been planning for months! Our stocks of all major pallet racking systems remain strong, we have a wide range of sizes and duties in Dexion, Link 51, Redirack and Apex as well as large quantities of Esmena and Planned Storage. We’re trying to get out as many orders as we can before the Easter break, if you are looking for new racking or accessories send us your enquiries now and we will do our best to get them to you in the next week. Straight after Easter we have deliveries going to Stockport, Newcastle, Birmingham, Essex, and Peterborough, so if you need racking to go to these areas, get your orders to us quickly for a great delivered price. 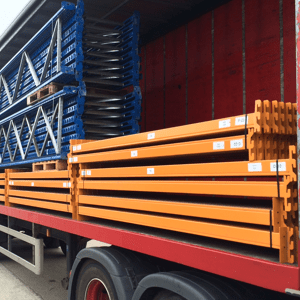 Used pallet racking orders are leaving our warehouse to go to all parts of the UK in the next few weeks, send us your order now and we will try to fit you in with a great delivered price. Used racking is going to Essex, Leicester, Stockport and Newcastle and we also have longspan shelving orders bound for Sheffield, Cardiff, Peterborough and London. We have huge stocks of Dexion, Link XL, Redirack and Planned Storage warehouse racking and we are due to take delivery of a large shipment of used Esmena in the next week. As well as that we have new pallet racking and heavy duty shelving plus decking and column guards. Call us now on 0800 612 3210 or send an enquiry.